Friday miscellany: CPC drones, trees and the sun! CPC drones are all over the place in downtown Ottawa as hundreds of Blue Team Robot-Worshippers gather for their love-in/prayer-fest/progressive-bashing convention. They are easily recognisable in the crowds. For one, they don’t dress very well. I have not ever seen as many “flood” pants in one place. And tweed jackets with elbow patches. And the younger drones don’t dress any better. Not a lot of hip folks in this crowd. But you can betcha that the lot of them will be gorging themselves on pork and beans at the buffet troughs this morning while having conversations on things like “how prayer should be mandatory in schools”, “why abortion is evil”, and “who can we demonize now that the hated Liberals have been pushed aside?”. Oh yeah – the “Opinion Elite”!!!! I’ll be taking a different route home this afternoon! I love trees. I truly do. They add depth and beauty to a landscape. They bring a neighbourhood to life. I grew up in a rural part of the country where trees of all shapes and sizes were everywhere! Maples, cedars, oaks, birches, hemlocks, pines, spruces, poplars… in abundance! But of course, being surrounded by such beauty can sometimes mean that one grows accustomed to the surroundings and takes them for granted. I didn’t realise my love for trees until I moved away from my rural home into a city. My wife and I bought our home in a neighbourhood with mature trees topped with billowing canopies. Our community was built in the early 1960’s by Robert Campeau – an early developer in what was then the far-flung suburbs in Ottawa. He did a lot of creative work, design-wise. He built homes on various elevations, for example, to break up the monotony of a one level street. He also planted lots of trees. So, 50 years later, our street and the others in the area are lined with big and beautiful monoliths. Unfortunately, about 75% of these trees are ash trees. Ash trees, genus Fraxinus, are common street, park, and forest trees. 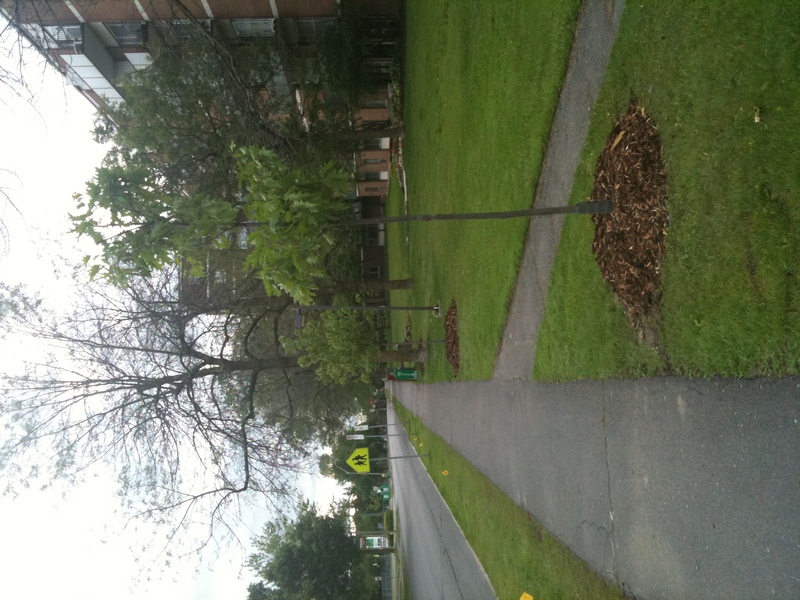 There are three species of ash native to the Ottawa area: white ash (Fraxinus americana) and green or red ash (Fraxinus pennsylvanica), and black ash (Fraxinus nigra). And a few years ago, Emerald Ash Borers were detected not too far from our community. These highly destructive wood-boring beetle feed under the bark of ash trees and can quickly destroy the tree. And that is the fate of 3/4 of the trees on our streets. Personally, we are lucky to have a Manitoba Maple on the boulevard as well as a wild cherry tree – so we’re safe – but we are the exception. The City workers were going around the neighbourhood earlier this week planting saplings in the shadows of the dying ash trees. And they are indeed dying. You can see one in the photo below. There is perhaps 20% of the foliage on a tree that, at this time of the year, should be pretty complete. 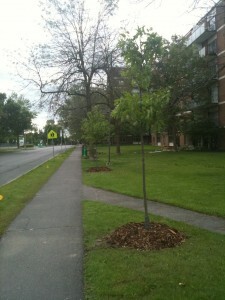 One thing though – the City has been a bit creative in their choices of species to replace the ash trees. Yes, there are the usual White Oaks and Manitoba Maples, but a good proportion of the saplings are Ginkgo trees! You can see these at Rideau Hall and I have posted pics of some beautiful Ginkgos in all of their full yellow splendour in Beijing! But it will take decades for these saplings to rival the ashes that will soon be removed. And those decades will see landscapes that nowhere closely approximate the beauty that is present today. Check this out. Someone sent me the link last week. It is very unusual and troubling. There is no paper trail behind the selection of the 32 projects,” said John Wiersema, the interim Auditor-General who recently took over from a retired Ms. Fraser. “I, personally, in my career in auditing, have not encountered a situation like that. Come on. This is indefensible. It was funny watching Pitbull Baird and his goofy sidekicks try to spin the AG’s report into something positive. Someone on Twitter pointed out to me (and correctly so) that the minority Parliament did pass this spending and there was nothing “illegal” about what they did – which is also correct. But I stand behind the assertion that it still was not proper. In order to “expedite” the spending, the CPC used some sleight of hand that should not be forgotten. But what do they care, eh? They have their freakin’ majority, don’t they? I’ll be in Wolfville, Nova Scotia for few days next week – looking forward to seeing the east coast again! Finally – what weird weather we’re having! We are either baking or freezing! Semi-arid or tropical! And the storms and the wind and the hail! Wow!!! !